From Dec 29, commuters who start their journeys at any of the 157 MRT and LRT stations before 7.45am on weekdays will see their fares discounted by up to 50 cents. The Public Transport Council (PTC) announced this yesterday as part of its annual transport fare review. It also said other transport fares will not be adjusted for now. Under the new initiative, a commuter who taps into Beauty World station before 7.45am to travel to Tan Kah Kee station will see his fare reduced from 87 cents to 37 cents. A student with concession fares, who pays 42 cents for the same journey, will pay nothing for his ride from Dec 29. The same would apply to any commuter whose ride costs less than 50 cents. The discount is also being extended to low-wage workers and people with disabilities, who already enjoy discounts under two concession schemes. The new initiative will mark the end of two existing trials to encourage off-peak travel. 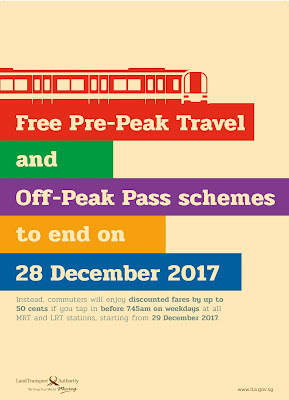 One of these is the Free Pre-Peak Travel scheme, which allows those who reach any of 18 MRT stations in the city area before 7.45am to have free rides. It is used by 65,000 commuters and has resulted in a sustained 7 per cent drop in peak-hour rail commutes. 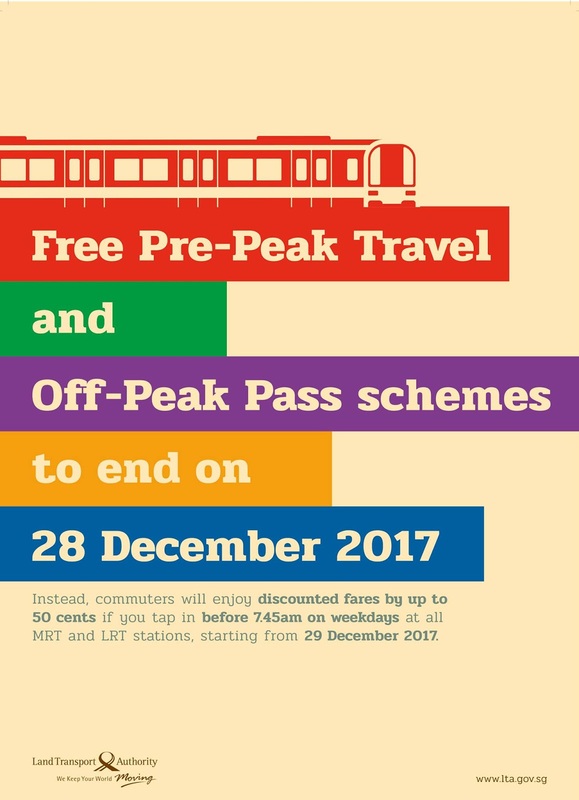 Another 13,000 use the Off-Peak Pass, which, at $80 a month, allows adult commuters to have unlimited bus and train rides during off-peak hours on weekdays and all day on weekends and public holidays. Both schemes end in December. PTC chairman Richard Magnus said the move to reduce pre-peak fares across the board will benefit around 300,000 commuters - or about 10 per cent of all rail commuters - who already travel before the morning peak. The council hopes it will encourage an additional 300,000 to start travelling earlier, said PTC chief executive Tan Kim Hong. Mr Magnus added: "Spreading out travel demand in this way will also make more efficient use of our public transport system, as capacity during off-peak periods will be better utilised." Mr Sitoh Yih Pin, chairman of the Government Parliamentary Committee for Transport, said that while any fare reduction was good, it was too early to say that it would make people change their travel patterns. "Different commuters will have different considerations," he said, adding that he hoped peak-hour travel would be reduced. The lower pre-peak rail fares amount to a fare reduction of 2.2 per cent. Another 3.2 per cent fare reduction will be rolled over to next year's fare review exercise. This year's fare reduction means that fare revenues for the public transport operators could be cut by $40.1 million a year. Mr Magnus said the council had to balance what commuters paid against factors such as costs to rail operators and the substantial investments made by the Government in public transport. The two rail operators - SBS Transit and SMRT - had requested no reductions in fares. Still, Mr Magnus said he believed they would not let their standards slip. Earlier this year, Transport Minister Khaw Boon Wan said it was not sustainable for taxpayers to subsidise the increasing costs of the public transport system. Mr Magnus said a review of the current fare formula - as well as of distance-based fare transfer rules for the MRT - would be completed early next year. Giving subsidies to commuters travelling throughout the MRT network during the morning off-peak period is likely to be an effective move to ease peak-hour crowds, said experts. 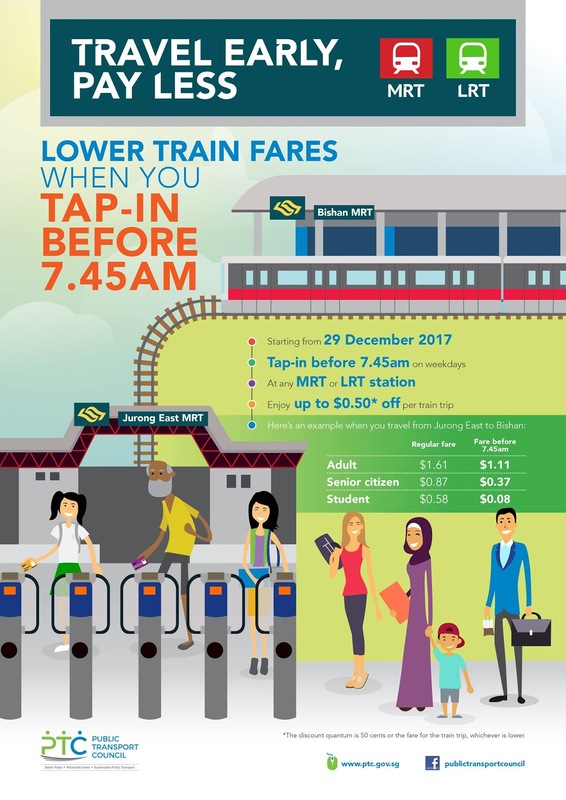 The Public Transport Council announced yesterday that commuters who tap in before 7.45am at any train station on weekdays from Dec 29 will receive a discount of up to 50 cents on their fares. Transport experts say this is an improvement on the existing scheme, which gives free rides to those who tap out before 7.45am at 18 MRT stations in the city area. Associate Professor Michael Li, a transport economist at Nanyang Technological University, said: "This is the right move. By giving the off-peak incentive, it should encourage people to move towards that time bracket. "Commuters definitely would respond. If 5 per cent of commuters make the shift, I think it would be a success." He added, however, that the Government would need to do a trial and error of the discount quantum to reach a price point that is most attractive for commuters to distribute the load more evenly. Singapore University of Social Sciences economist Walter Theseira agreed that the new scheme would ease peak-hour congestion. He added that it had a better chance of getting people to travel earlier than the existing free pre-peak period initiative. "Previously, people had to tap out before 7.45am to get free travel, so it benefits those who already travel very early anyway. 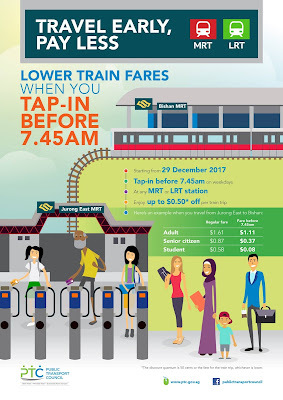 Now, by shifting 7.45am to the time people tap in, it is more targeted at those who travel around 8am to 9am, which is when there is a spike in commuters." He added: "It is now also nationwide rather than just the city area, including congested stations such as Jurong East. There are many travelling to work in commercial areas outside the city, so this will impact them too." Commuters interviewed had mixed views on whether such a move would make them change their travel patterns. Ms Nadia Rosli, 24, a project manager at a food manufacturing company, said she would not wake up 30 minutes earlier for a 50-cent reduction. "Maybe I would do it once a week but definitely not every day," she said. "I would also rather have fast, efficient trains that don't break down as much even if it meant paying slightly higher fares," she added. Mr Eugene Tay, 42, an executive officer, said: "I tap in at 6.45am, so I will get the discount but it's not a big deal. I would prefer that the trains are more frequent and on time." Ms Deanna Lim, 23, a lifestyle blog intern, said she would consider travelling earlier for the discount. "If I get to work an hour or so earlier, I can go to the gym and have breakfast before work. I wake up early anyway, so it isn't such an issue for me," she said.